The government of President Recep Tayyip Erdogan is intent on giving sweeping new powers to Turkish security forces to clamp down on the pro-Kurdish protests sparked by its blockade of the Syrian border city of Kobani during its month-long siege by the Islamic State in Iraq and Syria… In so doing, Erdogan has strengthened the security and military establishment whose power he has sought to curtail during the 12 years in office of his Islamist Justice and Development Party (AKP) government. In addition, he has jeopardised relations with Turkey’s Kurdish community, who form 20 percent of the population, 19 months after initiating talks aimed at resolving the decades-long conflict. This is threatening Turkey’s domestic stability just as economic growth is grinding to a halt and unemployment is rising. In 2013, the imprisoned Kurdistan Workers Party (PKK) leader Abdullah Öcalan called for an end to the three decades-long civil war, abandoned his demand of Kurdish independence in favour of greater autonomy, and announced a ceasefire agreement with the government. But Öcalan has declared that the talks would be over without some progress in the negotiations by October 15 and if Kobani fell to ISIS. According to Deputy Prime Minister Bulent Arinc, a proposed Homeland Security Reform Bill would “give the upper hand to the police” in the face of “widespread violence”, and “more space to resort to new tools and measures.” There will be harsher punishment for offenders damaging public property and demonstrators wearing masks to conceal their identities. The new measures come in the wake of a week of nationwide “solidarity” protests by Turkey’s Kurdish population–called by the HDP and the PKK via social media–in which at least 35 people were killed and 360 wounded. According to government sources, 531 police cars and 631 civilian vehicles were set on fire and around 122,000 buildings, including 214 schools, museums, and libraries, were damaged during the protests. More than 1,000 people have been detained and curfews imposed in several cities. While it was at first thought that protestors had died as a result of the security forces’ actions, it now appears that at least some of the deaths followed clashes between secular Kurds and the Sunni Islamist Kurdish group, Huda-Par, the successor organisation to Hezbollah (no relation to the Lebanese Hezbollah). Hezbollah was widely believed to have been trained and armed by the Turkish state, which unleashed them against the Kurds in south eastern Turkey, and to have been responsible for the unsolved murders of 500 Kurdish activists, writers, journalists and intellectuals in the 1990s. Davutoglu said that Turkey will not allow its citizens to fight in Kobani whether they are pro-ISIS, supporters of the Syrian opposition, or pro-Kurdish groups. He attacked Selahattin Demirtas, leader of the HDP, for saying that “tens of thousands Kurdish youth” were ready to take on ISIS if the Turkish-Syrian border gates into Kobani were opened. The fall of Kobani to ISIS would threaten the survival of the Syrian Kurdish autonomous region known as Rojava in the north and east of Syria, as it is located between two geographically isolated Kurdish areas along an east-west axis. The two remaining enclaves would find it difficult to resist ISIS, which would free up the Islamists to take the region north of Aleppo. Ankara views the Syrian Kurdish Democratic Union Party (PYD) and its armed wing the YPG, which control Rojava, as an offshoot of the PKK. 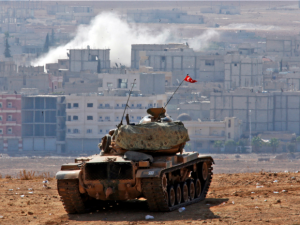 Having fought a 30 year war with the PKK over its demands for Kurdish independence, it fears that the PYD/YPG’s control of a relatively autonomous Syrian Kurdish region sets an example for the much larger Kurdish population in south eastern Turkey. The AKP government had refused to relieve the blockade unless the PYD dissolves its self-ruling local governments in northern Syria, joins the largely ineffectual Free Syrian Army which has opposed minority rights in Syria and is under Turkish control, distances itself from the PKK, and becomes part of Turkey’s “buffer zone project” along the Syrian border. The Davutoglu government now classifies both the PKK/YPG and ISIS as “terrorists,” after a recent shift, but it is, in effect, using ISIS against the Kurds. Indeed, one reason for Turkey’s previous sponsorship of ISIS as part of the military campaign to overthrow President Bashar al-Assad was to counter Rojava and Kurdish aspirations in Syria.